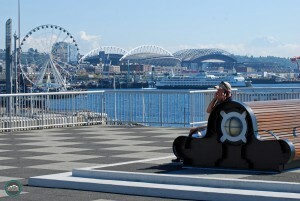 Put yourself in this situation: it’s time for lunch on a beautiful day in Seattle. You packed your meal and you want to enjoy the sunshine. 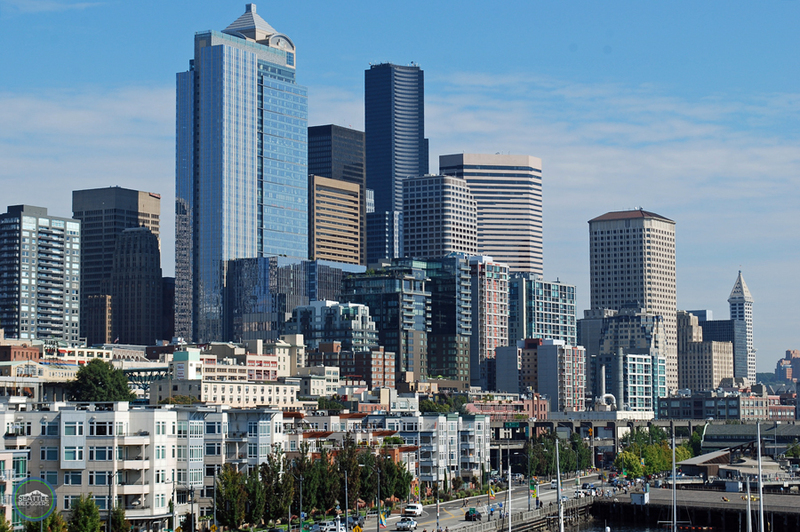 There are a hundred different places you can go around the city: Kerry Park on Queen Anne, Seacrest Park in West Seattle, or how about the Bell Street Pier rooftop deck? It doesn’t share the same hype as other top viewpoints in Seattle, but there’s no reason the Bell Street Pier rooftop deck (2225 Alaskan Way) shouldn’t be included in the conversation. 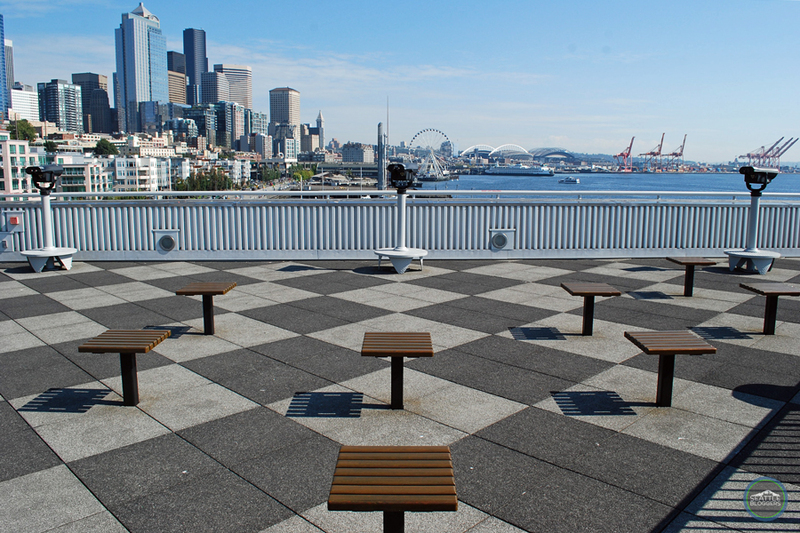 Located on Pier 66 on the Seattle waterfront, the Bell Street Pier rooftop deck offers one of the best views in the heart of the city. I know two different ways to access the Bell Street Pier rooftop deck: You can walk across the Bell Street Pier Pedestrian Bridge from Elliott Avenue (located near the Art Institute of Seattle at 2323 Elliott Ave), or you can take the large staircase (located near the entrance of Anthony’s — click here for a photo) to the rooftop deck along the waterfront on Alaskan Way. If you’re not crazy about the stairs, I’m guessing there’s an elevator inside the building as well. 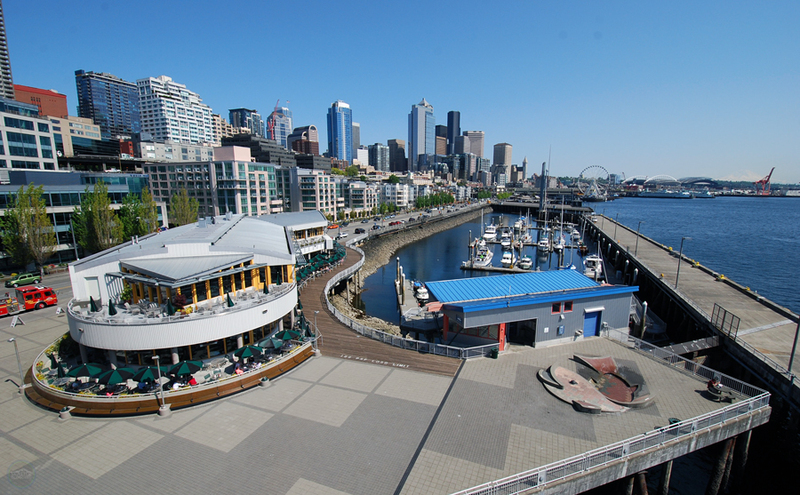 Here’s a little bit of history for you: Pier 66 has been a part of the Seattle waterfront for more than 100 years. It’s been known as Bell Street Wharf, Bell Street Terminal, and now it’s called Bell Street Pier. Used in many different ways over the years, the pier now offers a cruise terminal, conference center, marina, and of course, a free-to-the-public rooftop deck with a great view of Seattle. 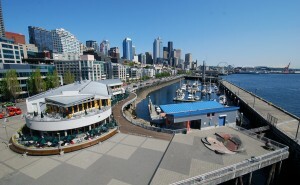 According to the Port of Seattle, the Bell Street Pier rooftop deck was known as ‘Happy Land’ in the 1910s. It featured a solarium and swimming pool, but was shut down in the 1920s due to “unsavory” activities of sailors and their female companions. The rooftop wasn’t opened to the public again until 1998. 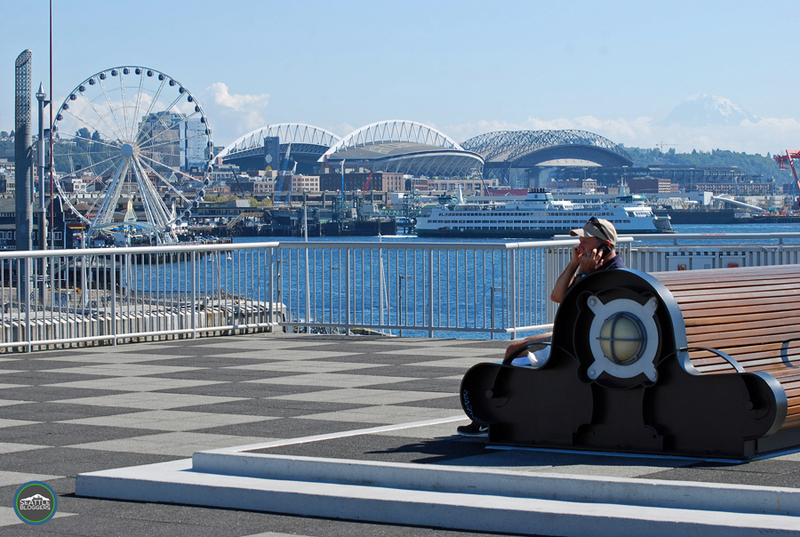 The Bell Street Pier rooftop deck is now defined as an “observation center.” You can see downtown Seattle, Elliott Bay, Mount Rainier (on a clear day), the Great Wheel, Safeco Field, CenturyLink Field, the Olympic Mountains, and even the Space Needle. 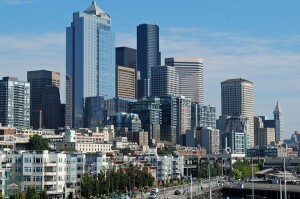 It’s the best of Seattle all packed into one location, and there’s plenty of room to enjoy the view. 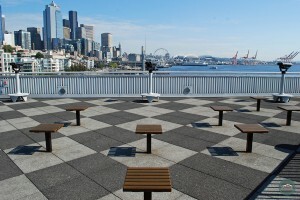 The Bell Street Pier rooftop deck has several stools and benches. What’s the best part about the Bell Street Pier rooftop deck? It’s not a massively popular spot (yet), so it’s pretty quiet. The few times I’ve visited, there was no more than a handful of people taking pictures or just chilling out. It’s a hidden gem that makes for a nice getaway from the hustle and bustle of city life. Have you ever visited the Bell Street Pier rooftop deck? What did you think of the view? We’d love to hear all about it! Please leave a comment below or connect with us on Twitter, Facebook, and Google+. Don’t forget to also check out Seattle Bloggers for more great places to experience in the Emerald City! 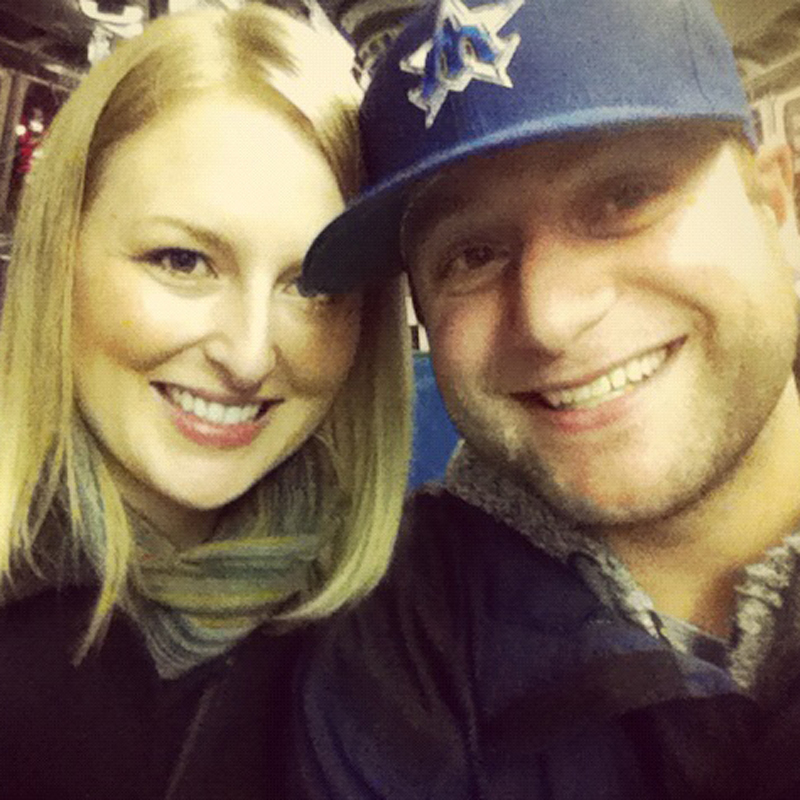 Are you related to Dan Lewis, formerly of KOMO NEWS? Anyone know what the summer hours, or at least what time it closes? This is a wonderful gem, thanks for sharing this jewel.